Tony and Julie Carlile are very special people. If you don't know them, then you have really missed a blessing. Dr. Carlile has served on our Board of Directors for Marketplace Missions since 1995. Tony and Julie have a gift of working with children. That was very evident when they were here in June. 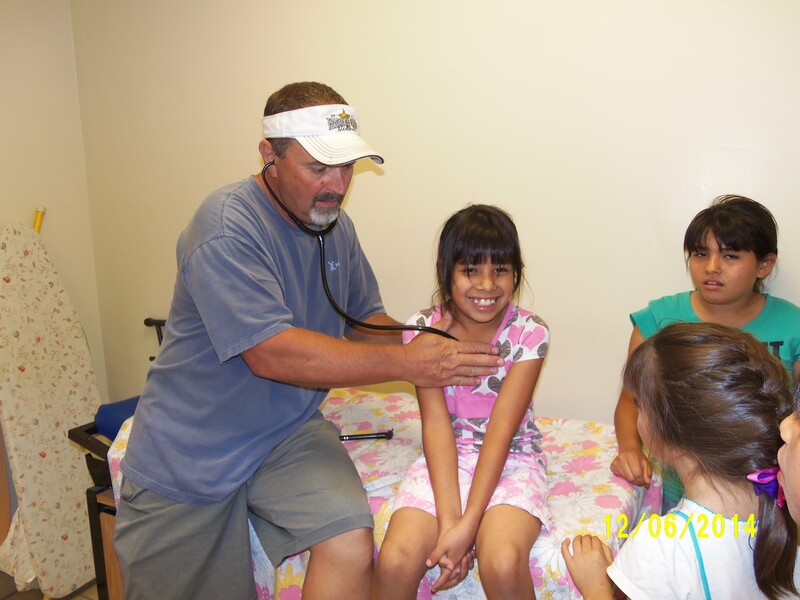 Of course, we put Dr. Tony to work right away doing physicals on the children and staff members. He did everything from removing warts to helping one of our staff children with problems with asthma. He was great with the kids. Julie is like the "Pied Piper" with the children. She had wonderful projects for the kids to do. One of their favorites was each child was given a hammer, nails and other building stuff. They each got a project to do….a truck, train, ect. They hammered, glued, put on stickers. I have never seen the kids concentrate like that!! The Carliles also helped me with my never ending work in the "orange" room. They sorted, folded, and moved tubs to storage. We look forward to Tony & Julie's return. Thanks so much for your help. We were blessed to have the School of Ministry from Canvas Church, located in the San Diego area come and minister to us in June. They came with willing hearts and hands. It takes dedication to our Lord to work in 100+ degree heat…but this group carried on and without complaint. During the mornings the group would split up into groups and work on painting on our stairwell, constructing a brick patio for our big 5th Wheel trailer or working in our "blessed" orange room. In the afternoon the team would present a evangelism message via a video presentation that the children loved followed by a craft related to the message. One thing that was really wonderful for all of us was that the children enjoyed eating lunch with the team every day. Since the children were in school in the morning, it gave them a chance to get to know one another better. We had a wonderful day celebrating Alexa's graduation and the end of school for a few months. 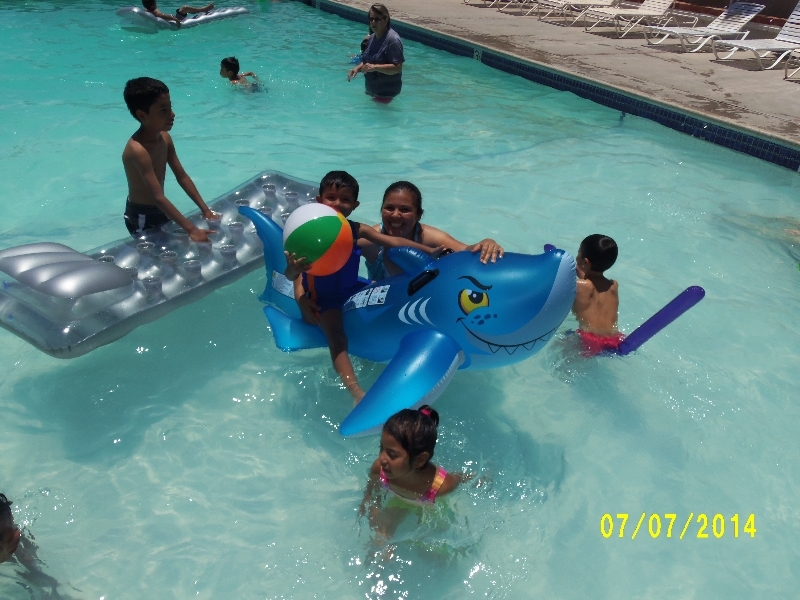 We spent the whole day at the pool. We ate hamburgers and of course ice cream. It was graduation day and as Alexa entered our dining room area, I could she was upset. She came immediately to me & I asked her what was wrong. She said that she was so nervous about the speech she was asked to give at the graduation. I put my arm around he & shared with her that I too had given the class speech at my eighth grade graduation. I told her that it was normal to be nervous, and assured her that she would do great. She and Mama Diana had worked very hard together to write her speech. She did do a great job. Alexa was also recognized as the top student academically in the 8th grade. The next step for Alexa is Junior High, which they call Secondaria. Alexa now has the challenge of " jumping into a larger pond" of students and I know that she will meet the challenge with courage and determination. 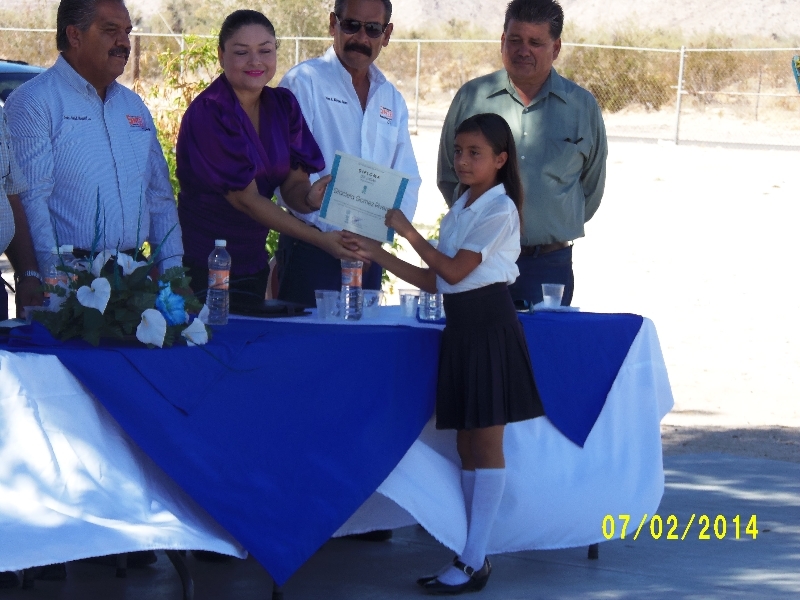 We had other Sonshine Hacienda students recognized for their academic achievements at the graduation ceremony. Jesus and Francisco Geraldo were the top students in their grades. 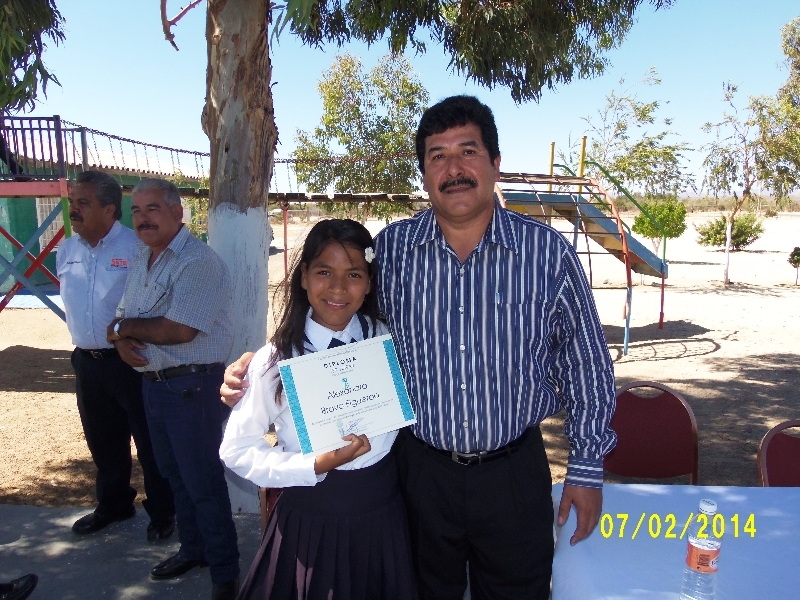 Perla and Chelita also took top honors for the third and fourth grade. They all received a certificate of achievement. These will go into their permanent record, so that when they are 18, they will have this special memory to take with them. Sonshine had an great opportunity to share with our small community of Las Minitas (where our school is located). The school is in dire straits due to lack of money. There was no money for the cupcakes that the teachers wanted to have at the graduation. God had just blessed us a few weeks before with tons of boxes of cake mixes and frosting…even the sprinkles. So, Sonshine was able to share our blessing with the children,parents and teachers of the school. We made cupcakes for everyone. Don't we serve an amazing God? 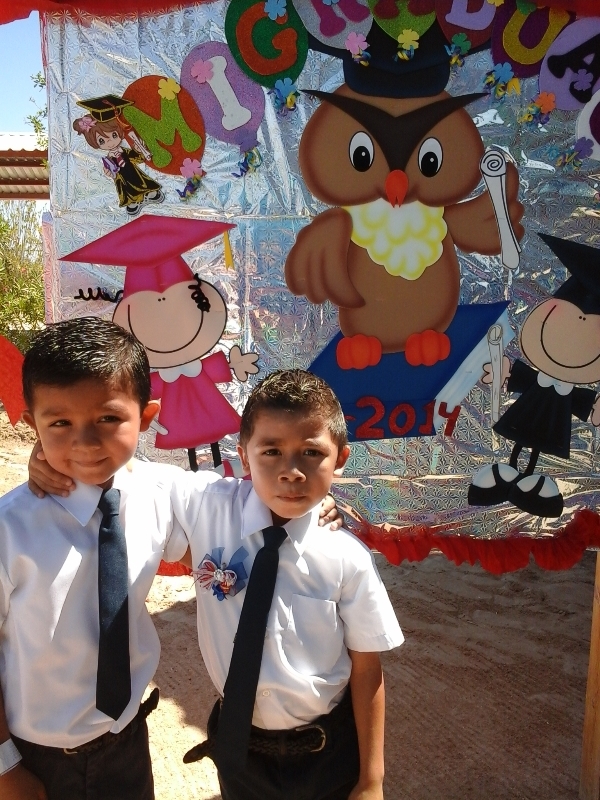 Two of our little men, Francisco and Joaquin graduated from Kindergarten this June. I remember taking them their first day of school, two years ago. They were so tiny at that time, at just three years of age. Now they are five years old and ready to head out to first grade. It is hard to believe that time has passed that quickly. Please pray for these two boys. They both have special problems that require them to be under Psychiatric care and medication. If they are unable to control their actions in school, they will not be allowed to continue in regular classes that are available in San Felipe. 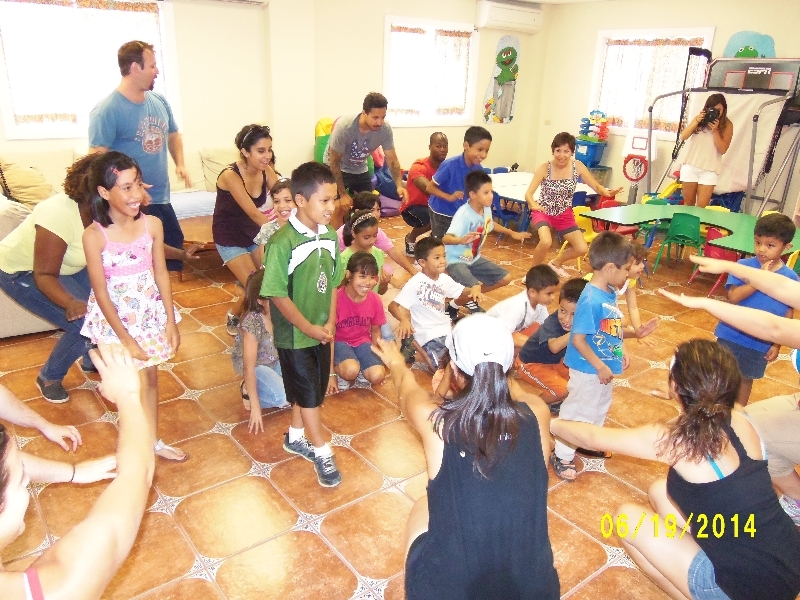 For their types of problems, the schools are located in Mexicali. Please pray for Francisco and Joaquin. In the picture above, Joaquin is not in the picture. He was in Mexicali at a doctors appointment and could not attend his graduation. Alvaro accepted his diploma on his behalf.